Blog – Page 2 – Half the girl I used to be – my 200lb weight loss journey! On the left is me at 340lb – something I never want to be again! I felt awful and so I’ll all the time. On the right is me last year at 268lb – I felt great and so much more confident. Plus I had energy I hadn’t felt in a while. Right now I’m sitting in the middle at 298lb – I’m determined to change that! I’ve stuck the picture on the left on my fridge door alongside some rather harsh words to myself (that I won’t repeat on here 😂) in the hopes it will remind me every time I try to snack that I never want to be there again. My name is Danielle and this is my open and honest journey to losing 200lb. I’ve decided to blog the long road ahead to help me hold myself accountable for my choices, but I’m new to blogging and honestly have no clue what I’m doing (I hope I’ll pick it up on the way) – so please be gentle with me. I’ve been overweight my entire adult life – at 20 years old I weighed 227lb (16.3 stone) and I’ve just kept getting bigger. At my heaviest I weighed 340lb (24.3 stone) and last year I managed to get down to 268lb (19.2 stone), however after having surgery in December and then celebrating Christmas and my Birthday, my weight has crept back up to 298lbs (21.2 stone). Last Saturday (5th Jan) I turned 34 and it was whilst looking through pictures of the day to decide which to post to social media that I realised I was basically catfishing myself – out of hundreds of photos I found around 4 that I deemed acceptable enough to actually post and that’s when it hit me – what a ridiculous way to live. To feel the need to spend hours trawling through pictures in the hope of finding just one picture that I can post that won’t show just how big I really am and won’t show too many wobbly bits that offend people and give people the ammo they need to talk nastily about me. Not only that but before loading the pictures my memories were of a fabulous day spent with my amazing partner and an evening spent with lovely friends, yet after being disappointed and disgusted at my appearance in photo after photo, my memories of the day suddenly became tainted. 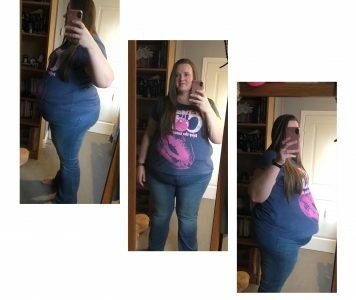 So I decided enough is enough – this is MY year and I WILL lose the weight. Not only will I lose the weight but I’m going to do it whilst posting openly and honestly. I will post about feeling great when I have done well all week and had a good loss but I will post too when I have completely messed up and even when I’ve gained (though hopefully that isn’t often). Most importantly though is going to be my refusal to catfish myself any longer – instead of taking lots of pictures to find the ‘one’, I’m going to take one picture and that will be the ‘one’. I’m dieting my own way – simply cutting calories. I’ve got absolutely nothing against weight programmes like slimming world/ weight watchers/ lighter life etc – it’s simply that I’m out of work at the moment and most weeks I couldn’t afford to pay the £5 fee let alone start purchasing their recommended and specialist foods. Also the whole ‘group thing’ feels like it wouldn’t work for me – I can be a moody wench at times and at these times general humanness annoys the crap out of me. I’m not big on vegetables or fruit and due to mobility problems I can’t go to the gym or exercise much at all for now so I want to prove that this can be done simply by being a little more careful about calories and fat. I realise this isn’t going to be easy and it’s certainly not going to be quick but I’m in it for the long haul and I’m 100% determined to do it. I’ve set myself a mini goal of losing 50lb before I go on holiday in May and then another mini goal of 50lb before my next birthday – so with a bit of luck, some determination and what I’m sure will be a hungry belly, I aim to weigh 198lb (14.2 stone) by this time next year. I will then chose my next goals going forward. On a final note, I’m kind of writing this blog to myself to help spur me on – especially at those times when I will have tried so hard but not seen the payout on the scales. However if you have stumbled across my ramblings and I’m not annoying you too much then please follow me – help me, inspire me or allow me to inspire you but DO NOT be negative – it’s hurtful and unnecessary and there is enough of that in this world already!